Every day is a challenge for Carson. His disease makes it difficult to control his motions and balance every moment. 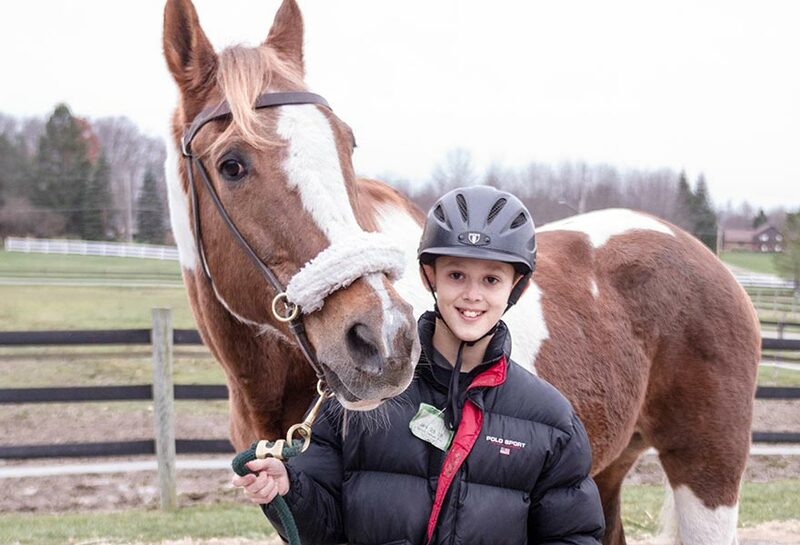 His family came to Fieldstone Farm eight years ago hoping that working with our horses would help Carson gain the strength, stability and stamina to help him better cope with daily living. It worked and it has been life changing for Carson and his family. He’s gained the strength to participate in many activities including soccer and even surfing! But while the physical benefits have been enormous, his mother says the emotional value has been even greater. “Being able to remove some of the ‘therapy’ from his activity has been so refreshing,” she says. Carson spends a lot of time working with speech, physical and occupational therapists, and being able to work on his physical goals while having fun has been a major plus. His mother says he looks forward to coming to Fieldstone Farm each week, and he even arrives early so that he can groom and tack up his horse.